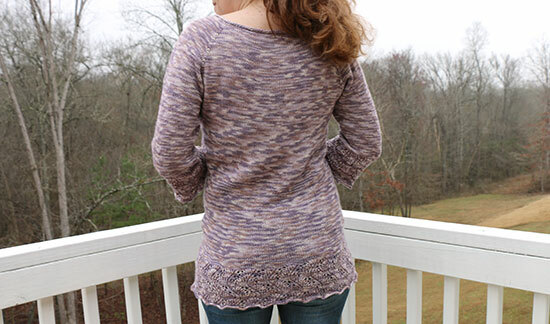 In 2014, I knit the Elphaba Pullover by Mary Annarella in madelinetosh Tosh Merino Light. It has a classic design, and the pattern is easy to follow. I still wear the sweater quite a bit in cooler weather. When I ripped out the Knit Diamond Pullover last month and was looking for a new pattern with which to use the yarn, the Elphaba Pullover quickly came to mind. The Mauve Mix colorway in Plymouth Yarn Reserve Sport would look quite different from the deep red Tart colorway used in my first version. I had knit the 37-inch (94 cm) size for the first version. At the time, it allowed 1.5 inches (3.8 cm) of positive ease. My body has changed over the years, so the same size sweater now allows 1.5 inches of negative ease. Since I still like the fit of the first version, and the pattern is intended for negative ease anyway, I stayed with the 37-inch size. I had added about three inches to the overall length and included one more waist decrease for the first sweater. This time, I added the same amount of length but kept the waist decreases as written in the pattern. I achieved gauge on US-4 (3.5 mm) needles. And yet, when I finished the pullover and compared it to my original version, this one is noticeably larger by about four inches (10 cm) in both length and width. Did my gauge change between the swatch and the project? 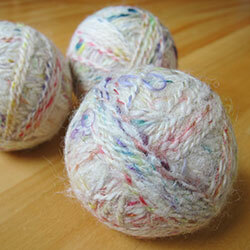 Or was there still some kink in the unraveled yarn that loosened up after blocking? No, measurements of the blocked sweater are still showing the correct gauge. Did the first sweater shrink over the years? That's entirely possible, and would make the new sweater seem overlarge in a comparison. Does the Tosh Merino Light hang differently than the Reserve Sport? I think this is also possible. 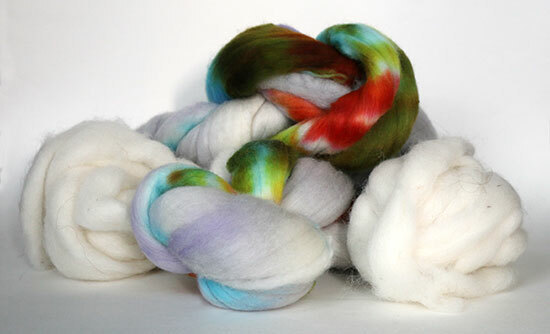 The first is made of 100% merino wool; the second is a blend of 45% wool, 35% silk, and 20% rayon from bamboo. 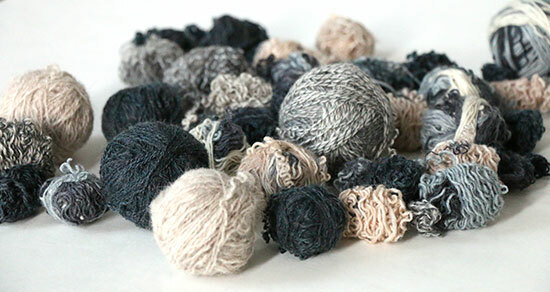 The silk and rayon could very well be affecting the overall grip and elasticity of the yarn. The good news is that the fit still works. I’m back to having a pullover with a little positive ease, as I initially had with the first version. And I rarely complain about extra length in my clothes. And, hey, in a few years it might shrink or I might grow. 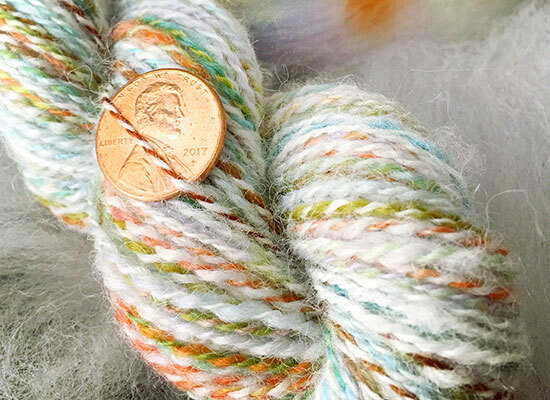 Last week, I wrote about my excitement to start a new spinning project after buying eight ounces of handpainted Targhee wool from Spunky Eclectic in the colorway Let Love In. This week, I separated most of the gray-colored fiber and hand-carded it with four ounces of white alpaca roving that I already had on hand, leaving the bright colors intact. The fiber spun up as beautifully as I had hoped, with one ounce (28 g) becoming 118 yards (108 m) of two-ply super fine yarn. It’s incredibly soft and bouncy, and captures the essence of spring-like silver skies and rainbows. I’m looking forward to spinning the remaining 11 ounces (312 g). If my gauge is consistent I should end up with a little more than 1,400 yards (1280 m) of yarn, which opens the doors to a wide range of projects. Then an interesting thing happened. The same day that I shared a photo of my newly spun yarn online, a friend on Facebook posted two photos from a theater. One photo was of her and her husband with another couple, smiling together as they waited for the performance to begin. The other was looking down from the balcony on a woman who was — GASP! SNICKER! — knitting. I’m not going to lie; that struck a nerve. The knitter was quietly minding her own business. The surrounding seats were empty enough that there was clearly plenty of time before showtime. Why shouldn't she spend that time doing something productive rather than, say, passing judgment on strangers? But then, isn’t my reaction passing judgment in return? I learned recently that my desire to keep my hands busy is medically considered a tic. I’ve found a harmless way to manage something that drives about 25% of the general population on a biological level. Research has shown that knitting and other such handiwork reduces anxiety levels, thereby coming full circle and reducing the incidence of tics. I don’t understand my friend’s contentment with simply sitting, drinking, and talking any more than she understands my desire to do something more in the same situation. I know that my friend is an intelligent person with a successful career. She’s a caring mother who tries to make the world a better place for her children by speaking out against the negative “-isms” that we encounter daily. The tone of her post doesn’t reflect the person I believe her to be. This example shows the limits to real communication on social media and other modern forms of electronic interaction — yes, including blogs such as this one. I don’t think her reaction would have been the same if she knew the knitter personally, and I don’t think she set out to be insulting when she posted about it. How could I respond without sounding overly-sensitive and defensive? By letting love in. Every one of us is a complex and contradictory combination of biology, environment, and experience. I don’t need to understand every nuance of you any more than you need to understand every nuance of me. Matching judgment for judgment may feel easier in the moment, but reflection from a place of love serves me better in the long run. That and keeping my hands busy. Today, that means I’ll be over here joyfully handspinning 11 more ounces of gorgeous fiber and daydreaming about what it will knit up to be. The most recent version of this project started when I found holes in the bottoms of a set of socks on our dining room chairs. I repaired those socks, then decided to knit sets for our coffee table and six kitchen chairs. It would be a lot of uninspiring knitting, but not unmanageable. As I was finally seeing the light at the end of the furniture sock tunnel, my daughter pulled out one of the bar stools at our kitchen counter. Nobody ever sits there. Why now? For that matter, why do we have so many places to sit? The noise as she scraped the stool across the floor made it clear that I needed to knit sets for those four seats, too. The supplies were already out. I might as well keep going. The size and shape of each furniture leg dictated the size of its sock. The smallest furniture sock was 20 stitches around, with decreases at the end, for a a total of 20 rounds. Each of those socks took a little more than a half hour to knit. None of the larger socks took more than an hour. I ended up making 48 furniture socks, which translates to at least 36 hours of knitting. And now it’s done! I no longer have to worry about scratches on the floors from the self-adhesive felt pads slipping off the bottoms of the furniture. Sure, the socks may wear through again, but I’ve already learned that the most-used chairs are the ones I need to watch. So far, I’ve noticed that the acrylic socks don’t hug the furniture legs as closely as the wool socks do. The acrylic doesn’t have the same springiness that the wool has, although it still holds its shape better than something with no elasticity, like cotton. For this purpose, that’s a secondary issue; my primary concern is the durability of the yarn. It will be interesting to see which sets need to be repaired next. Fingers crossed that any mending is a long way off. What projects have you recently powered through?